A back to school haircut is a right of passage. 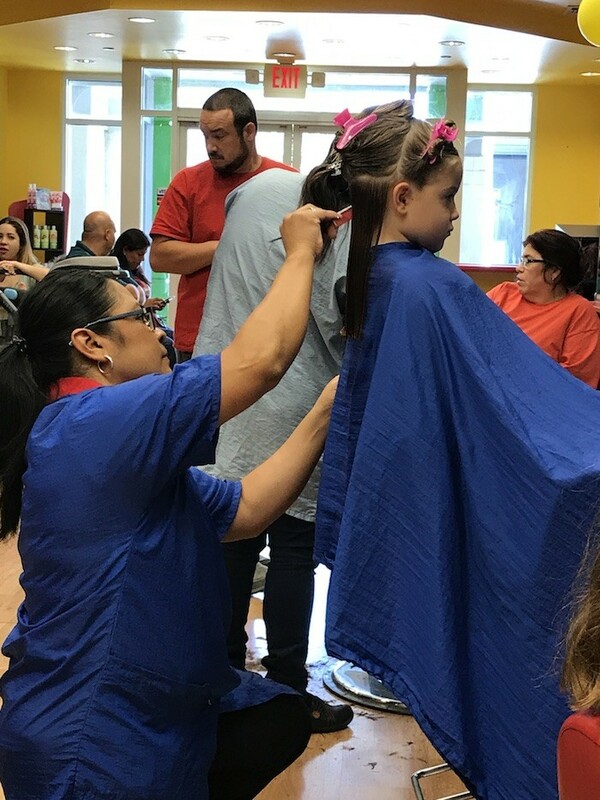 Moms & Dads across the country head out to get the summer hair “mops” trimmed and ready for the 1st day. 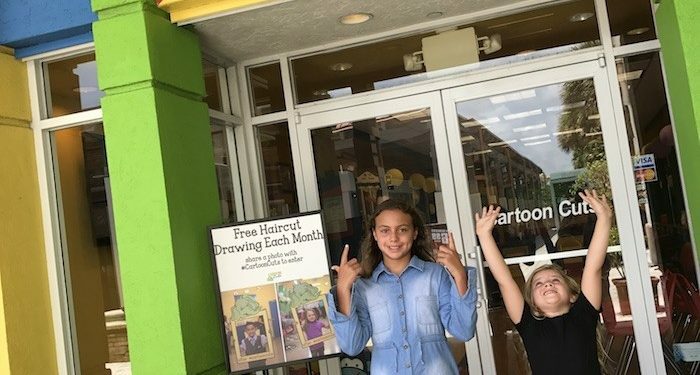 This year we were invited to visit Cartoon Cuts for our end of summer trims. Find the Cartoon Cuts closest to you! Located at a nearby mall, that has super easy parking, the girls and I headed out to complete this back to school must-do. As we arrived at Cartoon Cuts, we were greeted with warm smiles, very colorful decor and plenty of toys for kids, particularly if they’re under age 5. We had to wait a little bit longer than expected – this spot is definitely quite busy these last few weeks of summer. 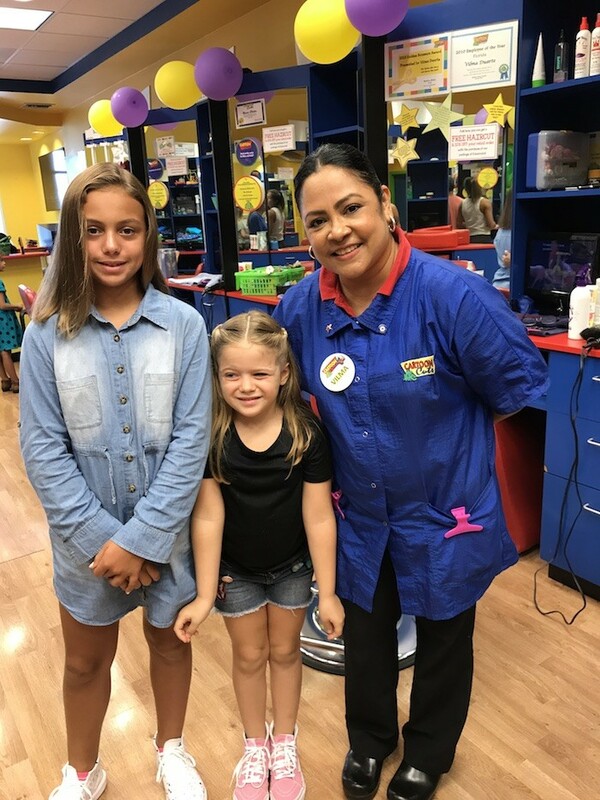 Before we knew it, Vilma, a hairdresser who has earned many awards – based on the decorations hung in her hair station, was super friendly and excited to begin cutting the hair of my baby girl. Designed so an elephant is spewing out the water to wash your hair, I fell in love with the setup of the Cartoon Cuts hair wash station. Rather than sitting in the traditional hair salon chairs and having to bend back, like we do, at Cartoon Cuts children simply lie down with their head tilted back just a bit. It’s far more child friendly. As my youngest was getting her hair washed, Vilma explained a little bit about the products she was using and some that were available to purchase. She reminded me that with the start of the school year, meant the start of lice. I cringed thinking back to what I experienced last year. At Cartoon Cuts there are TVs at each station. Vilma offered three different movies for the her to watch during the haircut. No more antsy-ness as she was now focused on watching SING and The Secret Life of Pets. Vilma carefully brushed through the blonde hair in a way that kept her from squirming. She is definitely a pro on how to brush the child’s hair, especially when we know how they react when we pull out the smallest of knots. We opted to have about three inches cut and Vilma got right to work. In no time, her hair was trimmed and blow dried. Typically that is when your service ends, but not at Cartoon Cuts, or at least not with Vilma. She took time to style the newly-cut hair with mini-twists. She suggested this easy-to-style do for the first day of school. I might just take her up on that suggestion! When Vilma had completed the near-first-graders hair, my 5th grader to her turn. Her experience went just as well, although I think this tween might soon be ready for a traditional salon. 1st day of school pictures look all the more better with a fresh haircut to accompany the ironed uniforms and polished penny loafers. Thank you Cartoon Cuts for our complimentary haircuts.